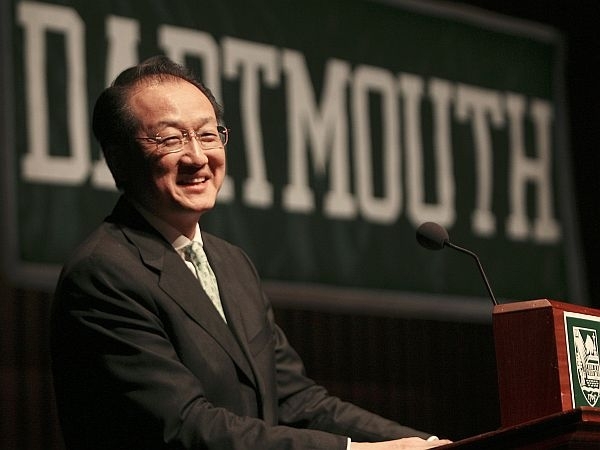 President Barack Obama has nominated Dartmouth College President Jim Yong Kim to head the World Bank, a surprise pick for the international financial institution’s top job. The Korean-born Kim is a physician by training and a prominent figure in global health and development circles. Officials believe his experience will help counter criticism from developing countries that have grown weary of the U.S. stranglehold on the World Bank presidency. Obama took a strong personal interest in filling the World Bank vacancy after current president Robert Zoellick announced in February he was stepping down. 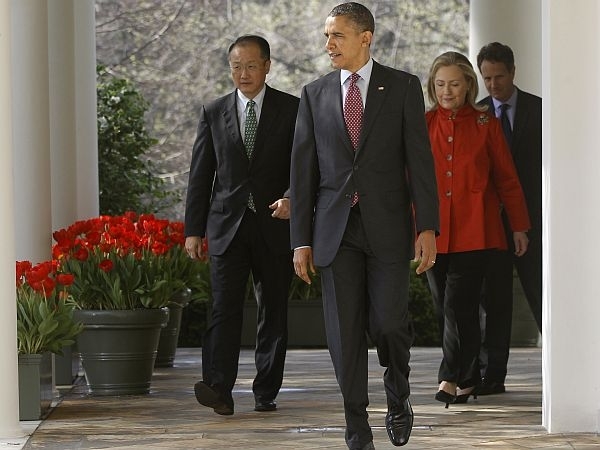 Obama and his advisers considered more than a dozen candidates, including well-known figures in the administration. But in the end, officials said, Obama pushed for a nominee with broad development experience and was particularly drawn to Kim’s innovative work fighting the spread of AIDS and tuberculosis. The 187-nation World Bank focuses on fighting poverty and promoting development. It is a leading source of development loans for countries seeking financing to build dams, roads and other infrastructure projects. Obama announced Kim’s nomination Friday during a White House Rose Garden event. The president was joined by Kim as well as Treasury Secretary Timothy Geithner, a Dartmouth alumnus, and Secretary of State Hillary Rodham Clinton, who officials said was the first to recommend Kim for the job. Former President Bill Clinton also weighed in with support for Kim during Obama’s deliberations. In a statement, the former president applauded Kim’s nomination. "Jim Kim is an inspired and outstanding choice to lead the World Bank based on his years of commitment and leadership to development and particularly health care and AIDS treatment across the world," he said. Since its founding in 1944, the World Bank always has been headed by an American. Developing countries have long sought to gain more power in the World Bank as well as its sister lending organization, the International Monetary Fund, which always has been headed by a European. While U.S. and European officials have voiced support for the developing world’s efforts to expand their power, the status quo remains, with France’s Christine Lagarde holding the top spot at the IMF and Kim’s candidacy for World Bank president all but certain to prevail. The actual selection will be made next month by the World Bank’s 25-member executive board. The United States, as the world’s largest economy, has the largest percentage of the votes. Developing nations are expected to put forward as many as three candidates, including Jose Antonio Ocampo, a Columbia University professor who had been finance minister for Colombia, and Ngozi Okonjo-Iweala, Nigeria’s finance minister, who has the backing of the three African countries on the World Bank board. Economist Jeffrey Sachs, the director of Columbia University’s Earth Institute, has openly campaigned for the World Bank post, saying the position should be filled by an expert in development issues. Obama administration officials said the pick was already being well-received in the developing world. After learning of Kim’s nomination, Rwandan President Paul Kagame said the physician was "a true friend of Africa" and "a leader who knows what it takes to address poverty." Kim is expected to travel around the world on a listening tour to rally support for his nomination ahead of the World Bank vote. The World Bank opening put Obama in the awkward position of choosing between his desire to be seen as a supporter of rising economic powers and the pressures of a political year in which support for a non-U.S. candidate could have opened him to criticism. "If the administration had pushed a non-American for the job, this could have been attacked as Obama fostering the decline of American influence in the world," said former IMF official Eswar Prasad, now an economics professor at Cornell University. "In an election year, Obama would have been accused of caving in to outside pressures and not being willing to protect U.S. interests." Obama picked Kim over several more well-known candidates, including Susan Rice, current U.S. ambassador to the United Nations; Sen. John Kerry, D-Mass. ; and Lawrence Summers, Obama’s former director of the National Economic Council. Others mentioned for the World Bank post included Indra Nooyi, the head of soft drink company PepsiCo, and Laura D’Andrea Tyson, who served in top economic jobs in the Clinton administration. Kim was born in Seoul, South Korea, and moved to the U.S. at age 5. He is a graduate of Brown University and Harvard University. He co-founded the global health organization Partners in Health and served as director of the World Health Organization’s department of HIV/AIDS. He began his tenure as president of Dartmouth in 2009, becoming the first Asian-American to lead an Ivy League institution. Jim Yong Kim, an American who is president of Dartmouth College, has been chosen to be the next president of the World Bank. His selection Monday extends the U.S. hold on the top job at the 187-nation development agency.